The fishing this past week was good despite windy and rough conditions off shore. We spotted schools of Tarpon on our depth finder but never saw any roll, which is typical when there is 3-4 foot waves off the beaches! They were hunkered down staying out of the nasty conditions too, we did manage some sharks in the same areas and they kept the rods bent for clients while waiting for bites. The inshore fishing has been steady too and there are Redfish, Snook, and Spotted Sea Trout all to be had in the bays. 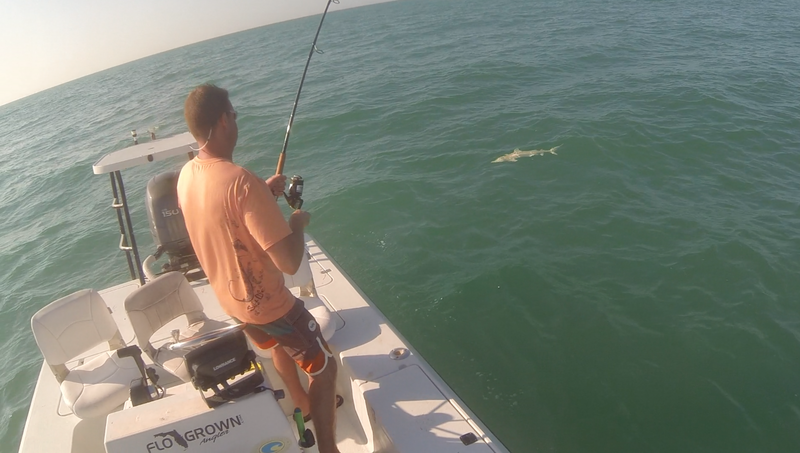 I used some of the same baits we used for Tarpon this week to get a few strikes from some nice Redfish. Threadfin herring don’t last as long as pilchards do but when they die they make perfect cut bait for Redfish and whatever else is hungry for an easy meal. This coming up week will be perfect conditions to try and find the schools of migrating fish off the beaches. Slow tides during the day and light winds should make for some great opportunities. Stay tuned for more pics and information on whats happening in Fort Myers, Estero, Bonita Springs, Naples, Sanibel and all of southwest Florida. Captain Mark Yimin has been living in southwest Florida almost his entire life. Serving areas of Ft. Myers, Estero, Sanibel, and other nearby locations, Calusa Fishing Adventures is the premier inshore charter fishing experience.